Well now I have seen everything. Breaking Bad has had a lot of really strange episodes that blend multiple genres, but making a western themed episode that is just absurd. In fact it’s so absurd that it actually works, as “Dead Freight” is another perfect episode if what is easily becoming the best season of Breaking Bad. Now let me tell you, I am a sucker for Western’s and so when Walt, Jesse, and Mike, along with the information from Lydia, planned on robbing a train, I nearly squealed with excitement. Just like “The Great Train Robbery” or truly any Western heist film, this heist was one for the books. However, before getting to that stuff, some interesting stuff happened in the beginning. After bugging Hank’s office (nice crocodile tears Walt), and kidnapping Lydia they finally discover it was the D.E.A that bugged the canisters. 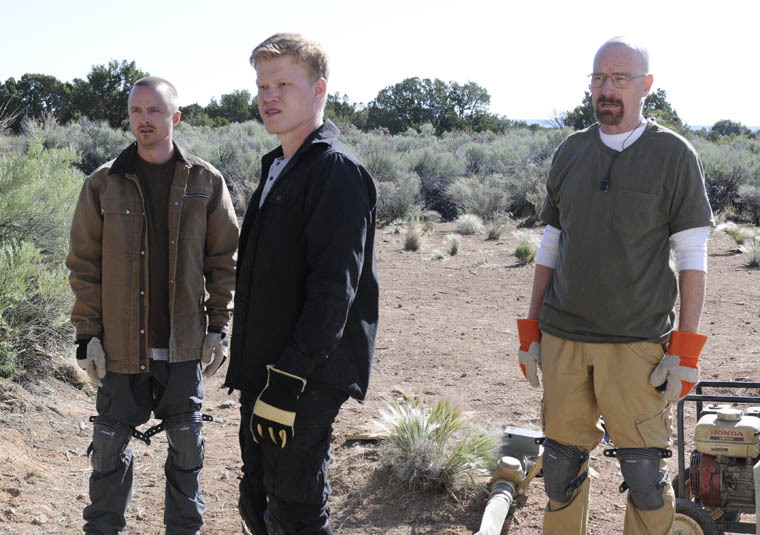 I am happy they did not drag this mystery on for a few episodes, as Breaking Bad can do sometimes, and immediately went to fixing the problem, being a new way to get methylamine. This leads to the entire premise of the episode, as Lydia confesses that she knows where to get “an ocean” of the stuff. The heist itself was an absolute feat within itself. I mean emptying the tanker and then filling it with water without any witness. Early on Mike mentions that there are two types of heist: one where the guys get away with it and those that leave witness’. While Jesse was clever enough to find a way to siphon it (he’s becoming quite the clever robber) without the conductors being any the wiser, it came to have some faults- in particular a little boy looking for spider’s near the tracks. Never have we seen up close an innocent bystander be so brutally killed in the show. Sure Gale was killed, but this was because he was in the meth business. This kid was simply an innocent gunned down by one of Mike’s stupid henchman, Todd. I am sure this will create a divide between Mike and Jesse now, and I’m sure it’s safe to say that Todd is going to end up in a ditch somewhere. More so, it will be interesting to see how Walt reacts. Walt has used let innocent people get hurt in the past, but will this be the tipping point? Doubtful, but I am sure it will change his dynamic with Jesse once again. Breaking Bad has constantly been a show where viewers have learned to expect the unexpected, and well this episode delivered that. With one hell of a robbery and a brutal finisher, I cannot wait to see just how far Walt is willing to go to build up his crystal empire.